As an Apple smartphone (iphone or ipad) user, it is advisable to turn off iMessage before switching to other non-Apple devices like Android or windows phone, in order to achieve the purpose of switching. In case you don’t know why you should turn off the iMessage before switching, then read on to find out why. Read Also: How to factory reset an iphone without having the password or security code. 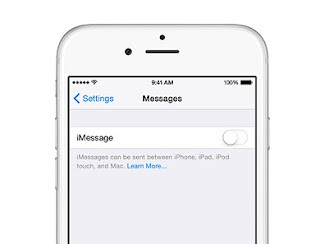 When iMessage is been turned off in an iphone or ipad phone, it makes the device to receive text messages sent from an iDevice whether you are still using an Apple device at that moment or not. In other words, to carry out this function on your iphone or ipad devices, we have got you covered with the below simplified steps, just follow it as outlined. => Ensure to have your Mobile SIM card inserted on your phone. => Then locate your Settings Menu. => Next, Click on Messages. => And then, Turn off iMessage, after that go back to Settings menu again. => Now Click on where you see FaceTime. => And Turn off the FaceTime. That’s all, you can now exit the settings menu. Should in case you don’t have an iphone or ipad again, then proceed to Apple Website to turn off the imessage. That is For those Who don't Have their iDevice Anymore. 3 Expert Tips To Speed Up Your iphone Device Charging Rate To Get Full Within one hour. How To Configure Your iPhone Vibrations To Tell who's Calling. Next coming on this blog is iphone imessage games, apk apps for android, more settings and tricks, with recovery and update. Solution to iphone imessage waiting activation, failed or not working, auto reply, effects and gif animations, iphone imessage account blocked or no better attachment file to be sent, solution to crashes with bug fixes and lots of more, will be treated on this blog. Just stay tuned to our daily post.